While there are numerous such references in the Bible to ancient real or predicted natural disasters beginning with the Great Flood, we only need to consult today’s news or, possibly, look out our own windows to witness such events today. 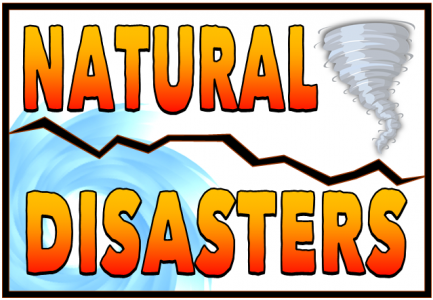 Natural disasters have been occurring throughout the history of the world. While public administrators and policymakers throughout the world, including the United States, have had to prepare for, respond to and recover from a wide range of natural hazard events, such as wild fires, earthquakes, floods, tornadoes, blizzards, hurricanes, etc., the most effective methods of minimizing death, injury and property destruction is through mitigation and a responsive public. Serious natural hazard events may not be preventable, but the degree of death and destruction can be reduced and recovery could be expeditious with proper planning. Flood plain and coastal management regulations minimize risks to private property or public infrastructure in high hazard areas, building codes harden property against earthquakes and high winds from tornadoes and hurricanes, and clearing of dry undergrowth in forests are among proven tools to mitigate the more harmful impacts of these hazards. “As a country with experience of coping with earthquakes, tsunamis and other natural disasters, Japan believes in emphasizing the mainstreaming of disaster risk reduction. We therefore prioritize investment in disaster prevention and post-disaster improvements under a policy of Build Back Better,” according to Japanese Prime Minister Shinzo Abe. September is considered the peak of hurricane season in the Gulf region and along the East Coast of the United States. Hurricane Season annually runs from May 15 to November 1, with the largest storms historically occurring from mid-August to mid-September. There are five categories of hurricanes based primarily on wind speed. However, the rising temperature in oceans has hurricane experts calling for a new category for monster storms as Category 6 www.insideclimatenews.org. They are even suggesting that conditions may allow hurricanes to form on the West Coast of the United States in the future. Better early warning systems and tracking are among the important steps to reducing lost of life in such events. During eight years of Witt’s leadership, FEMA gained respect from Congress, the media and the public by the professionalism of agency personnel and their success in quickly responding to numerous disasters. Until the terrorist attack of September 11, 2001, FEMA was an independent agency comparatively small by federal standards. It functioned by coordinating efforts of other federal agencies, non-profits and state emergency personnel and that coordination became far more effective when President Clinton designated Director Witt ad a member of his Cabinet. Unfortunately, Witt’s successor had neither the experience nor his common-sense leadership style. With the creation of the Department of Homeland Security, FEMA was relegated to a much less prominent position within the DHS bureaucracy without the same degree of clout it had enjoyed in the Clinton Administration. Many of the professional emergency managers left or retired as their expertise in dealing with natural hazard events was less valued in an agency whose priority mission was fighting terrorism. The agency’s tragically ineffective response to Hurricane Katrina saw the lead response assumed by military leadership. In more recent times, FEMA has continued to struggle as evidenced by the failures in Puerto Rico after Hurricane Maria that are continuing to be felt a year after the tragedy. FEMA functioned best when it operated as an independent agency with professional disaster management leadership, with a focus on mitigation of the most serious potential impacts of natural hazard events. However, implementing effective mitigation efforts requires extensive public education. Property owners in floodplains or coastal areas often fight against flood insurance requirements that reduce damage in extreme events. People in harm’s way of disasters often underestimate the danger when evacuation would be the wiser course endangering themselves and potential rescuers. Others prefer to build in forested hills using materials that are attractive, but combustible. Building back better requires professional emergency management policies, personnel, with extensive public understanding and support. Author: Richard T. Moore is a former Associate Director of Mitigation at FEMA who led the development of the first National Mitigation Strategy. He has served in both elective and appointed public office at local, state, and federal levels of government. He served for nearly two decades each in the Massachusetts House and Senate, as well as being chosen as President of the National Conference of State Legislatures. A former college administrator and adjunct assistant professor of government at Bentley University and Bridgewater State University, Mr. Moore is a long-time member of ASPA serving terms as Massachusetts Chapter President and National Council member.